The consequences for BP are profound: A successful capping of the leaking well could finally begin to mend the company’s brittle image after weeks of failed efforts, and perhaps limit the damage to wildlife and marine life from reaching catastrophic levels. A failure could mean several months more of leaking oil, devastating economic and environmental impacts across the gulf region, and mounting financial liabilities for the company. BP has already spent an estimated $760 million in fighting the spill, and two relief wells it is drilling as a last resort to seal the well may not be completed until August. Let’s hope for the best. Given the challenges of the previous efforts, it sounds like it will take a monumental effort to stop the leaking well. Which begs a question…should BP be tapping a larger set of minds to help solve the leaking well? Can they crowdsource a solution? In a way, they’re already doing it. Sort of. You can call an idea hotline to suggest ways to stop the oil. They even have the number posted on their home page. But why not take it a step further? A formal crowdsourcing effort. I’ve heard that the folks at Innocentive asked this on an NPR report. Another vendor also pitched its idea management software, however BP didn’t bite. Spigit hasn’t pitched BP, but would certainly be willing to help. Are they valid? Let’s see. If a company hasn’t previously mastered open innovation and crowdsourcing, a crisis is a hell of a time to give it a go. This is far from comprehensive, but I did find a couple examples of BP’s forways in the world of crowdsouring and open innovation. The need to work with others to solve tricky problems has most likely been around since humans learned to communicate, pooling their skills to achieve a desired mutual goal. In today’s world, collaboration between partner organisations has become highly sophisticated, particularly so in the energy industry where new challenges abound, be those in security of supply, cleaner energy sources, or the bringing together of different scientific and engineering disciplines to focus on a common problem. Certainly the oil spill qualifies as a tricky problem. So BP has experience in crowdsourcing internally on marketing ideas, and in open innovation with academia and industry partners. Not too shabby, and that argues for their having a favorable disposition toward crowdsourcing. OK, I’ll admit. I have no idea how I’d stop the oil leak. Maybe I could come up with an idea as I give my kids a bath (“so you take the rubber duckie, and move it over the drain…”). Several veterans of that operation are orchestrating technicians in the Gulf of Mexico. To lead the effort, BP has brought in Mark Mazzella, its top well-control expert, who was mentored by Bobby Joe Cudd, a legendary Oklahoma well firefighter. The real gamble was in the original insertion—the damaged riser’s structural integrity is unknown, and any prodding could have worsened the spill, or prevented any hope of other riser- or BOP-related fixes. Given the highly technical nature of these efforts, and the myriad complexities, does it make sense to crowdsource? I’d say it does, in that a proposed idea need not satisfy all elements of risk mitigation and possible complications. That puts too high a burden on idea submitters. Start with the idea, let the domain experts evaluate its feasibility. Keep in mind that people outside a company can solve technical challenges. Jeff Howe wrote in Wired about the guy who tinkers in a one-bedroom apartment above an auto body shop. This guy solved a vexing problem for Colgate involving the insertion of fluoride powder into a toothpaste tube. If BP were to set up a public site that allows anyone to participate, I can guarantee that some percentage of ideas and comments will be devoted to excoriating BP. In fact, it wouldn’t surprise me if much of it became that. A free-for-all that has nothing to do with solving the oil well leak. A public forum receiving press attention during an extreme crisis presents angry individuals with a too-tempting target to make mischief. BP could spend more time deleting or responding to comments than getting much from it. The anger is too strong, too visceral on the part of many across the world. Charlene Li talks about meeting criticism head-on in her book Open Leadership. Perhaps one way BP could handle this would be to set up a companion forum where criticism could be moved to. Keep an idea site dedicated to just that…ideas. But I can see how BP understandably would not want to deal with such a site, as it potentially becomes a major PR pain on top of the existing maelstrom. This reason strikes me as the one most likely to keep BP away from a crowdsourcing initiative to complement their other efforts. What do you think? Should BP be crowdsourcing solutions to the Gulf oil spill? 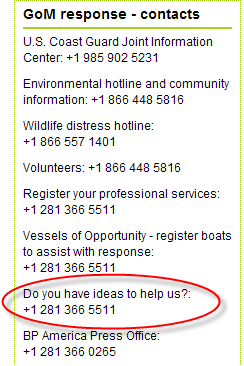 17 Responses to Should BP crowdsource solutions to solve the Gulf oil spill? I wish someone would call me so i could give them my idea on how to stop the oil leak if the top kill fails… They are using everything i have thought of to myself thus far..but there are a few steps i think they need to consider.. it might just work.. I’m very practical..I have excellent insight.. I’m quick.. intelligent.. and a problem solver from way back. my common sense is far and beyond most… I would want to talk to the right people who have first hand knowledge in this matter.. The solution to shut off the oil flow can be had with the Theodore Cap. The Theodore Cap is like a fluted dowel, wider at the top and tapered down to the bottom. The bottom should be about 3/4 of the top. The flutes start at 2 feet from the top down. The 2 feet top, without the flutes should fit the inside diameter of the blow pipe. Included in the 2 feet top is a wider part about 3 inches with a rubber seal that should rest on top of the blow pipe. The bottom of the Theodore Cap should be rounded to deflect oil pressure to the sides and to channel the oil pressure into the flutes. The whole length and weight should be in correlation to the depth of the hole and the pressure, to be decided by on site specialists. The Theodore Cap should be constructed of high grade dense concrete with no re-bars, as they in time may corrode. If BP doesn’t start crowdsourcing for ideas, others will. Check http://bpoilnews.com/environmental-impact/crowdsourcing-the-oil-spill-your-suggested-solutions/ already some ideas to be found there. If they want to speed things up, they should ask for advice on a global scale using crowdsourcing. PARALLEL VERTICAL UNDERWATER WELL/UNDERWATER CONVENTIONAL EXPLOSIVES CHARGE TO STOP HORIZON LEAK: A second carefully controlled well drilled parallel to (also vertical) and a short distance from, the subject leak well, yet far enough away to allow drilling of the well to occur without oil from the leaking well to seep into this new Explosives Charge Well. Yet this new well would need to be close enough to affect the subject leak well with a powerful conventional underwater explosive charge. The conventional underwater explosive charge could be set off, say 2/3 to 1/2 the way down. If set off lower, say 2/3 the way down, a chance to set off another charge could shortly follow in time by the explosives team, say 1/2 the way down. Engineers/geologists familiar with the well could carefully make the decisions. It would bring soil, rock and otherwise heavy/large movement of substantial earth onto the subject leak eliminating the current well/pipe, preventing oil from passing through the current well and/or pipe. The existing pipe and passage will be simply crushed inward by substantial earth movement, at perhaps many levels near the lowest points that are practical to place the charge. In effect both wells ultimately will be crushed inward at a point of depth somewhat well above the levels that the oil sits. The distance we can surmise of the beginning of drilling of this new explosives well, can be say 8 feet (or other distance) from the subject well, though geologists and engineers at the site, who are familiar with the current well can decide, along with the best explosives experts, to make sure the subject leak well is crushed in at as many levels as possible. Depth of the explosives charge well also to be carefully determined by all including geologists on site familiar with the Horizon well. Army corps and industry have experts, including those on site have access to new suitable rig and drill, equipment, expertise, materials. Some sensible improvising of placement of the conventional underwater explosives will be needed by explosives experts, with army corps overseeing effort. Would a few special capped bombs sink to the bottom and ignite it near the well will work? This way the side pressure from the explosion will close the well. This problem could well affect the future of the oil industry and to use it to score points, be they political or business is not helpful. ํYes. I think, they should have more protection system. It’s have huge effect to world’s environment. They shoud do. Yes. I think it is BP responsibility to protect it.